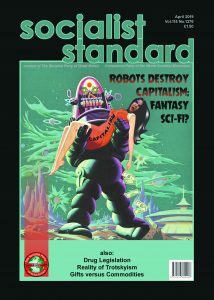 Critique has recently published the translation of an article by Ernest Mandel, in which he develops his now familiar theme that, in the course of social evolution, there intervenes – and must intervene – between capitalism and socialism a transitional “society” with its own social base, relations of production, etc. This is a point of view worth discussing but, despite the Marxist terminology in which it is expressed, it is in fact not a view held by Marx himself. As the present article will try to demonstrate, Marx did indeed speak of a “political transition period” between capitalism and socialism but never of a “transitional society”. What, then, did Marx mean when he spoke of this “transition period”? Contrary to what is generally supposed (largely as a result of decades of Stalinist and Trotskyist propaganda), for Marx this period was not that between the establishment of the common ownership of the means of production and the time when the principle “from each according to his abilities, to each according to his needs” could be implemented. Rather it is the period during which the working class would be using state power to bring the means of production into common ownership. In other words, the transition period is a political form between the capture of political power by the working class within capitalist society and the eventual establishment of socialism, a period during which the working class has replaced the capitalist class as the ruling class, i.e. as the controller of state power. The end of this transition period is the establishment of a classless society based on the common ownership and democratic control by the whole of society of the means of production, with the consequent disappearance of the coercive state, of the system of working for wages, of the production of goods for sale on a market with a view to profit, indeed, of buying and selling, money and the market altogether. That for Marx the “transition period” was the period after the capture of political power by the working class and before the actual establishment of the common ownership of the means of production is clear both from his early and his later writings. “The views of German scientific socialism on the necessity of political action by the proletariat and of its dictatorship as the transition to the abolition of classes and with them of the state. . .” (emphasis added). Marx, we can note here, used the words “socialist” and “communist” interchangeably to refer to future classless society (if anything, he preferred the word “communist”, but we shall follow Engels’ later usage and employ the word “socialism” to describe future classless society based on the common ownership and democratic control of the means of production). The idea that “socialism” and “communism” were two successive phases of post-capitalist society is not to be found in Marx, but derives from Lenin. Thus, when Marx writes, in the above quote, of “communist society”, he means precisely the same as when he wrote of “classless society” in 1852. It is true that Marx realised that, had socialism been established in his day, it would not have proved possible to implement immediately, or even for some years, the principle “from each according to his ability, to each according to his needs”, i.e. free access for all to consumer goods and services according to individual need. In the early years of socialism, established at this time, there would inevitably have had to have been some restrictions on access to consumer goods and services, some form of, if you like, “rationing” (if this word’s association with the war-time and post-war ration cards is forgotten, for although full free access according to need would not have been possible in 1875, the amount allocated for consumption could have been considerably higher than the workers were then getting under capitalism). Marx suggested as one such possible method so-called labour-time vouchers. It is important to realise that this was only a suggestion and, moreover, one open to serious objections. But Marx’s point was that, for some period of time, some method of rationing consumption would be necessary. He referred to the period of socialism during which this would be so, as “the first phase of communist society”, as compared with a “higher phase” in which free access to consumer goods and services could be implemented. Note that Marx is talking of different phases of the same society, society “based on the common ownership of the means of production”, i.e. a classless, stateless society with no wages or monetary system (Marx made it clear that the “labour-time vouchers” were not money, “no more ‘money’ than a ticket for the theatre” as he put it in Capital ). No doubt one could speak of a transitions from the “first” to a “higher” phase of socialism, but the fact remains that Marx did not employ the concept of “transition period” in this sense. For him, as we have explained, it was the transition from capitalism to socialism and not from one phase of socialism to another. How long did Marx expect this political transition period to last? His opinion on this question changed over the period of his political life. In 1848, he clearly felt it would have to last quite some years. Thirty years later, he and Engels thought it could be considerably shorter, as a result of the tremendous development of modern industry in the intervening period. “its political supremacy to wrest, by degrees, all capital from the bourgeoisie, to centralise all instruments of production in the hands of the state, i.e. of the proletariat organised as the ruling class; and to increase the total of productive forces as rapidly as possible” (emphasis added). Marx and Engels go on to list various immediate measures which they and the other members of the Communist League felt the working class should take on coming to power, in order to make “despotic inroads on the rights of property”. “No, no more than existing forces of production can at one stroke be multiplied to the extent necessary for the creation of a communal society. In all probability, the proletarian revolution will transform existing society gradually and will be able to abolish private property only when the means of production are available in sufficient quantity”. “When Karl Marx and Friedrich Engels wrote ‘The Manifesto of the Communist Party’, – that is to say, about the middle of the nineteenth century – capitalism was dominant only in England; the United States was still a colonial country, in which the agricultural population far outnumbered the industrial; in Europe, the beginnings of capitalism were confined to the west – in Germany, for instance, pre-capitalist forms of production were still dominant; Russia and Japan were still feudal states; and there were relatively few points on the Asiatic coastline which were in contact with those occidental countries in which capitalist development had begun. If socialism wasn’t possible in 1848, this raises the interesting question (clearly relevant for later attempts to establish “socialism” in a single, backward country): What would the working class, or rather a determined group of Communists, have been able to do in the unlikely event of them having gained control of political power at that time? Surely, only to develop capitalism. In fact, the measures listed at the end of Section II (“Proletarians and Communists”) of the Manifesto, and referred to above, could accurately be described as being of a state-capitalist nature. Many of them have since been implemented in openly capitalist countries (progressive income tax, state bank, nationalisation of railways, free education, prohibition of child labour, etc. ), thus indicating that there was nothing inherently anti-capitalist about them. Is it too much to say that, had Marx and Engels and the others in the Communist League come to control political power in 1848, that, not being able to establish socialism, they would have been “irrevocably lost”, in that they would have had no alternative but to develop capitalism (even if in the form of a state capitalism)? In any event, this situation never arose, nor was it even a remote possibility. In exile in London, Marx and Engels soon realised the futility of communists plotting to seize political power in the immediate future, and turned to concentrating on the long, hard task of preparing the working class to organise itself to capture political power. In other words, it was Engels’ opinion that by the 1870’s, contrary to the situation in 1848, “the state of economic development was . . . ripe for the elimination of capitalist production”. While he might not have answered the question, “Will it be possible for private property to be abolished at one stroke?” with a ‘yes’, he would certainly have answered that it could be abolished (i.e. common ownership, and a classless society established) fairly rapidly. The principle is clear here: for Marx and Engels, the higher the level of development of the means of production, the shorter the political transition period needed to make them the common property of society as a whole. Engels was exaggerating when he wrote in 1872 that the means of production could then have provided “enough for the plentiful consumption of all members of society and for an abundant reserve fund”. Certainly, they could have provided enough to completely eliminate material poverty and to raise the consumption of all well above the level they had to endure under capitalism, but it would not really have been possible to implement the principle of “from each according to his abilities, to each according to his needs”. Engels, or course, recognised this, and it was precisely Marx’s point as well in his notes on the Gotha Programme about the inevitability of some limitations on free consumption in the “first phase” of socialism. Having discussed the question of how long Marx and Engels expected the political transition period between capitalism and socialism to last, we can now ask, how long did they think the transition (as one might want to call it) between the “first” and “higher” phases of socialism itself would take. This is something they don’t seem to have discussed, but it is clear that the same principle applies: the higher the level of development of the means of production, the shorter the period. One thing is clear, though, that the development of the means of production during this period would be on the basis of the common ownership and democratic control of the means of production, and the consequent abolition of the market, money, buying and selling, wages, profits, etc, The “first phase of communist society”, like the higher phase, would be a non-market society in which production would be consciously planned to satisfy human needs. What would be produced would be useful things, for direct allocation to democratically-decided social uses (individual consumption, collective consumption, expansion of productive resources, reserves, etc.). What Marx called “commodity-production”, the production of goods for sale on a market, would not exist; indeed could not exist without the society ceasing to be socialist. Marx repeatedly made it clear that socialism, in both its phases, was a non-market, production-solely-and-directly-for-use society. The Communist Manifesto specifically speaks of “the Communistic abolition of buying and selling”, and of the abolition not only of capital (wealth used to produce other wealth with a view to profit), but of wage labour, too. In Volume I of Capital Marx speaks of “directly associated labour, a form of production that is entirely inconsistent with the production of commodities …”, and, in Volume II, of things being different “if production were collective and no longer possessed the form of commodity production. ..”. Also, in Volume II, Marx, in comparing how socialism and capitalism would deal with a particular problem, twice states that there would be no money to complicate matters in socialism: “If we conceive society as being not capitalistic but communistic, there would be no money-capital at all in the first place. ..”, and, “in the case of socialized production the money-capital is eliminated”. In other words, in socialism the production and distribution of wealth is solely a question of organisation and planning. Significantly, he does not question why this should have been, since this would have led him to have to admit that, on this point, the Bolshevik thinkers were in the Marxist tradition. This “transitional society”, like capitalism but unlike socialism, can be established on a national scale. In fact, says Mandel, it should be the immediate aim of each national working class (thus rejecting the Marxist view that the working class of all countries should be aiming at a more or less simultaneous world socialist revolution). If Marx had really subscribed to this view, that there was another system of society –lasting for a whole “epoch” – between capitalism and socialism, it is curious, to say the least, that he never mentioned it. Nowhere, in fact, does Marx speak of any “transitional society” in between capitalism and socialism, or, to use some of the phrases employed by Mandel, “the epoch of transition from capitalism to socialism”, “a transitional-economy”, “the society in transition from capitalism to socialism”. He certainly spoke of a “political transition period” and of “a period of revolutionary transformation” between capitalism and socialism but, as we have seen, this was merely the period during which the working class would use its control of state power to establish the common ownership of the means of production, a relatively short political transition period, which would be shorter the higher the development of the means of production was at the time the working class won control of political power, and certainly not lasting an “epoch”. Mandel tries to justify his position by identifying his “transitional society” with Marx’s “first phase of communist society” (despite the fact that the phrase “first phase of communist society” obviously means what is says: the first phase of communist, not some other, different, society). Marx, we have seen, did recognise the inevitability of some limitations on free consumption in the early stages of socialism (had it been established in the 1870’s), and did mention “labour-time vouchers” as one possible method of doing this. Mandel claims that whether these labour-time vouchers or money is used in these circumstances, is just a matter of choice. Money, he argues, is better because it allows workers, as consumers, more freedom of choice than would labour-time vouchers, or some system of physical rationing. We do not want to defend the “labour-time voucher” system. Even for Marx’s day, it was inappropriate, suffering from numerous anomalies, only some of which Marx himself recognised. We would subscribe to the view that Marx’s criticism of schemes to introduce “labour-money” under capitalism, applies to some extent also to the scheme for “labour-time vouchers” in the early stages of socialism. But it is clear that Marx did not regard the use of money (a commodity that has come to be universally exchangeable with all other commodities) as an alternative form of rationing in the “first phase of communist society”. In fact, he would have regarded this as an absurd, contradictory proposal. We can imagine him lambasting Mandel in the same terms as he lambasted Proudhon for similar inanities! Let us now return to the question of how long, after the establishment of socialism, some restrictions on free consumption would have to continue. Today, looking back, we can say that, had world socialism been established in the 1870’s, it might have taken about a generation before full free access to consumer goods and services, according to individual needs, could have been implemented. This estimate is based on the fact that it was by around 1900 that the effects of the so-called second industrial revolution – the application to production of the electric motor and the internal combustion engine – were beginning to be felt. Marx and Engels, remember, were judging the possibilities of socialism on the basis only of the first industrial revolution (the application to production of the steam engine). Marx, who died in 1883, never saw either an electric motor or an internal combustion engine. But of course every advance in technology made his case for socialism even more relevant. We can, in fact, place the end of capitalism’s role in history – to create the material basis for a world socialist society of abundance – at this time. By 1900, capitalism had completely outlived its usefulness. From then on only the immediate establishment of world socialism has been “progressive”. 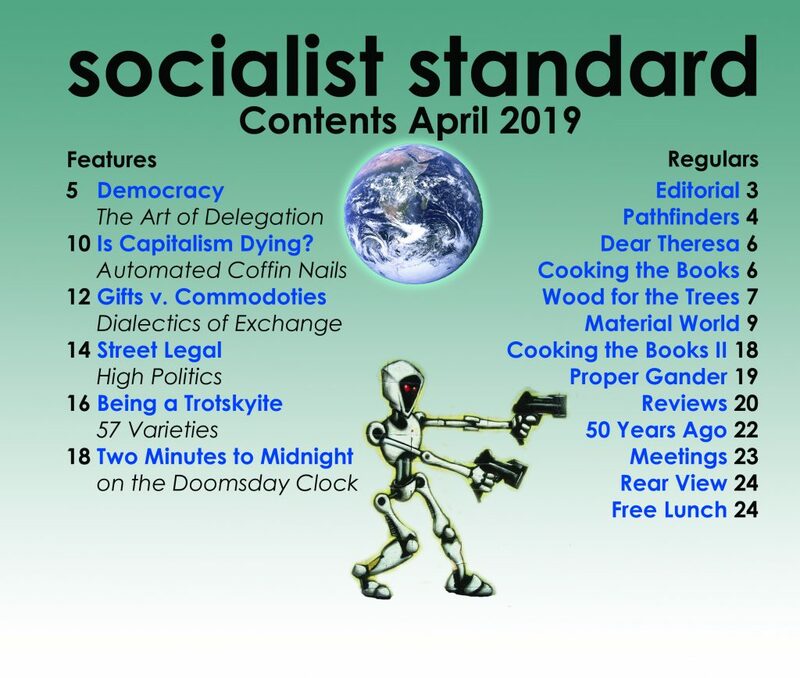 From then on, in fact, world socialism – given, of course, the development of a majority socialist movement amongst the working class in the industrialised parts of the world – could have been established “at one stroke” by a more or less world socialist revolution. Since 1900, the working class has still, it is true, needed to organise itself to capture political power in all the various states of the world, and, in this sense, a “political transition period” during which the working class uses state power to establish the common ownership of the means of production, is still necessary. However, since this period would be so short as to be negligible, the concept of a transition period has become outdated. Similarly, though in the first few years of socialism, as the mess left by capitalism is cleared up, some restrictions on full free consumption may still be necessary, world socialist society could now move rapidly (i.e. in well under a decade at the most) to implementing free access to consumer goods and services according to individual need as the principle of distribution. To sum up, the concept of a “transition period”, lasting some years, between capitalism and socialism is today an obsolete 19th century concept, while the ideal of a “transitional society” between capitalism and socialism, as proposed by Mandel, was never to be found in Marx in the first place.